Located in New York City�s historic Gramercy neighborhood, Gramercy Theatre opened in 1937. Gramercy spent just over 60 years as a movie theatre and art-house until 1998, when it was renovated into a 499-seat playhouse to present Off Broadway theatrical productions, the largest in the city at the time. In 2004, the theater was shut down. In 2006, Live Nation bought the space with the intention of turning it into an intimate concert venue. The theater offers an ultimate rarity among the city�s mid-sized music venues: a mix of actual seating in back with general admission standing room in front, and a sound system that caters well to both. 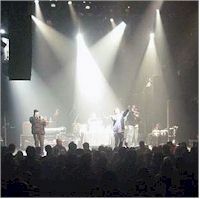 The Gramercy Theatre is one of the top New York City venues for concerts and other events. Don't miss some of the biggest names in music as they come to New York City area's Gramercy Theatre to perform live.